Programmed and produced a collaboration between SŌ Percussion and the Joshua Light Show for the 2013 River To River Festival. So Percussion were offered a developmental residency to continue evolving their concert-length work “Where (We) Are’ and integrated it with elements of other pieces from their rep. The developmental residency included “open studio” hours when the public could watch the band at work. The Joshua Light Show team joined So Percussion for part of the residency to engage with the music which informed the final performance of their light show accompanying the concert. 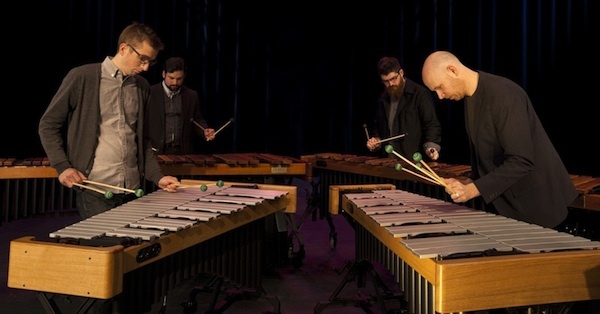 For over a decade, So Percussion (Eric Beach, Josh Quillen, Adam Sliwinski, and Jason Treuting) has redefined the modern percussion ensemble as a flexible, omnivorous entity, pushing its voice to the forefront of American musical culture.